Economics professor Alok Bohara wants to establish the Nepal Studies Center at the University of New Mexico as a beacon. Bohara is the founder and expert guiding the Nepal Study Center’s research and community engagement work in Nepal. A Nepalese-native, Bohara is very concerned about the number of bright minds like his that have left Nepal to live and work in other places. In collaboration with many of his colleagues from various U.S. universities, he is working on a way to turn what most people would call a brain drain from Nepal into something else. That’s why the Nepal Study Center offers a way for UNM students and faculty to look at fundamental questions of poverty, health, climate change and survival in the Himalayas. 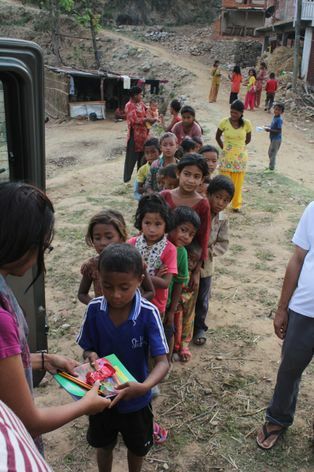 Students in line for school supplies in Nepal. Bohara and Mark Stone, associate professor of Civil Engineering, are participating in a volunteer project with UNM engineering and architecture students who are designing a low-cost earthquake-resistant house that could be built in Nepal with locally available materials. If all goes well, the students hope to take their design to two villages in Nepal next December. They will work with the Pratiman-Neema Memorial Foundation and local residents to build the demonstration homes. 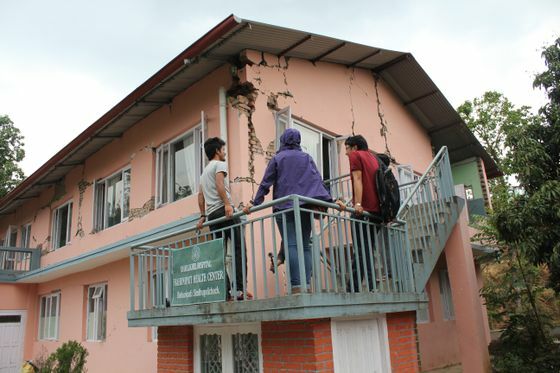 The project began spontaneously after he and other faculty members and students heard about the recent earthquakes. Bohara, Stone and Associate Professor of Earth and Planetary Sciences Joe Galewsky and three graduate students traveled to Nepal last December to begin making contacts to put together a research project on climate change. They are still working on a proposal for the climate change project and will submit it to the National Science Foundation later this year. It’s an example of the kind of research the Nepal Study Center is engaged in. 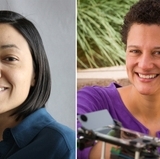 Graduate students frequently work on specific projects as varied as health, environment, climate change, food security, urban sanitation and conservancy and water quality. U.S. universities frequently search for ways to develop strong international ties, and UNM now has formal memorandums of understanding with institutions in the region including Kathmandu University and the International Center for Integrated Mountain Development as a result of Bohara and the study center. This has also resulted in high level visits from both sides. The Nepal Study Center also sponsors an annual Himalayan Policy Research Conference in association with the Annual Conference on South Asia in Madison, Wis. It offers an opportunity for students to present research papers in a professional setting and engage in networking. Those papers are published and available online at the Nepal Study Center website. Bohara and a team of his colleagues have also worked with UNM Libraries to publish a new online journal titled “Development of the South.” They just published the first issue. Bohara and his doctoral student had been looking at the economic and health effects of microfinance for women in the small village of Bahunepati. But when the clinic was destroyed, the microfinance program, which was run from the clinic site also suffered. The other two community assets – its school and temple, were also destroyed during the earthquake. Bohara believes that rebuilding the heart of the community – the clinic, school and temple – can bring back the community more rapidly. Bohara is hopeful that they can rebuilt quickly so the village can regain its social capital and the women’s program will continue. Bohara has an eye on the long-term future, but the UNM students who have established a Facebook page UNM4Nepal are thinking of the present. They are in the process of completing their house design and preparing to raise money to travel to Nepal to build the houses in December. It is the combination of research and action that is attractive to the many volunteers.